OPB March 6, 2017 9:11 a.m. This month, OPB will premiere a new Oregon Experience documentary “Broken Treaties,” which examines the history of the native people of Oregon, and how they went from possessing 100 percent of the state’s land to nearly none of it. The one-hour documentary premieres Monday, March 20 at 9 p.m. on OPB TV and will be available to watch online at opb.org/brokentreaties at the same time. Oregonians today generally know little about the first inhabitants of the region, the tribal people who lived here for thousands of years before European contact. Indians still have a significant presence, with nine federally recognized tribes located around the state, yet they continue to live “off the radar” of most non-Indians. Before Euro-Americans came West, this region was home to a diverse and remarkable mix of Indian tribes and native languages. What is now Oregon was Indian country—hundreds of villages in an environment of natural abundance, in which most people thrived. In the early 1830s, the Oregon Trail established a direct route to the Pacific Northwest. The government encouraged Americans to make the journey and settle here to strengthen its claim to the territory. Two Congressional laws, the Northwest Ordinance of 1787 and The Organic Act of 1848, each declared the United States’ commitment of good faith and fair treatment toward the native people. Early settlers often did not heed these pronouncements. They settled where they pleased, which began the slow but relentless acquisition of the Indians’ most valued asset: their land. The transfer of land away from the Indians took more than a century and assumed many forms—and it was effective. In 1850, before any treaties had been signed or any land legally acquired from the Indians, Congress passed the Donation Land Act, giving 320 acres of Indian land to every settler who wanted it. Within five years, they would claim 2.8 million acres of it. Congress sent envoys to acquire Indian land legally through treaties, even as the government—before any documents were ratified—continued to promote settlement there. Frequent conflicts broke out between the newcomers and the Indians. Ultimately, most tribes, weakened by introduced disease and fearing extermination, signed treaties. This typically entailed ceding most of the tribes’ land to the government and moving the Indians to a reservation. Sometimes those treaties were not ratified and never became legally binding, yet the government kept the land and kept the Indians away. Today, the native people’s history remains punctuated with unfulfilled promises and unfinished business. Yet most Indian populations, education levels and economic power are on the rise. Most Oregon tribes contribute significantly to their surrounding communities through natural resource improvements, casino jobs and philanthropic giving. Though many others may still not know much about them, the tribes of Oregon are increasingly making their presence known. 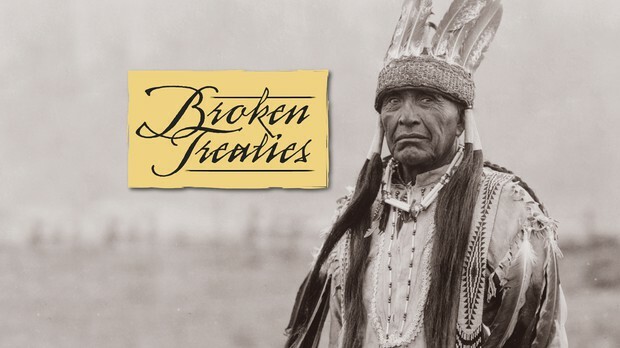 “Broken Treaties” airs Monday, March 20 at 9 p.m. on OPB TV and will be available to watch online at opb.org/brokentreaties at the same time. It is written and produced by Eric Cain and edited by Lisa Suinn Kallem.